Animal Farm: Synonym Antonym Vocab Crossword—Use with Bookmarks Plus! Note: This product is meant to be used after students read the book. Students solve this puzzle by providing synonyms or antonyms for 25 vocabulary words from ANIMAL FARM. A fun way to learn vocabulary! NOTE: This puzzle contains the 25 Words to Know from ANIMAL FARM edition of Bookmarks Plus--a FREE product! Animal Farm edition of Bookmarks Plus—Fun Freebie & Handy Reading Aid! FREE! Also, these same 25 words are part of my ANIMAL FARM 50- Word Prereading Vocabulary Puzzle. See list below. Use all three to reinforce meaning! More unique products over ANIMAL FARM—perfect activities for early test finishers, between lessons, extra credit, or at the end of the day! View them in my store. •	Bookmarks Plus: ANIMAL FARM edition—A Handy Little Reading Aid! FREE! Helps students keep track of characters and provides definitions for new words—and much more! Students and teachers alike are delighted with these helpful bookmarks! Download this free one and see for yourself! 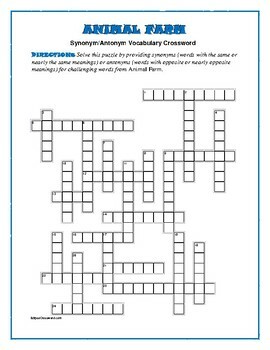 •	ANIMAL FARM: Synonym/Antonym Vocabulary Crossword—Use with the Animal Farm edition of Bookmarks Plus and the Animal Farm 50-word Prereading Vocabulary Crossword to reinforce meanings of new words! •	ANIMAL FARM: 50-word Prereading Vocabulary Crossword—Use with the Animal Farm edition of Bookmarks Plus and the Synonym/Antonym Vocabulary Crossword to reinforce meanings of new words. Helps prepare students for reading the book! •	ANIMAL FARM Trivia Game—Fun for the Whole Class! My ThemeQuotes games are the only games that link famous, value-promoting quotations to the themes of the books you teach! Students work in teams to play this cross between Wheel of Fortune™ and Trivia Pursuit™ game! 240 questions! •	ANIMAL FARM: 10 Quotefall Word Puzzles—A Great Spelling Workout! Each quotefall is a quotation from AF. Students form individual words of the quotation by transferring letters from above the double line of the puzzle grid to squares in the columns directly below. Quotefalls can be challenging, but students love working them—and they’re great spelling workouts! •	ANIMAL FARM: 10 Word Merges—One “Word” Becomes Two! Two-word phrases from the story are blended into one “word.” Students decipher the phrase. Harder than it sounds, but a good spelling workout! •	ANIMAL FARM: 16 Theme-Related Quotations Plus Teaching Ideas! Well-researched quotations by some of history’s greatest thinkers that relate to the theme of the book! •	ANIMAL FARM: Anagram Crossword—Great Spelling Workout! Students decipher common terms from the novel! The puzzle can be challenging, but, as with all crosswords, each time they enter a correct answer, they are provided with clues for the next. 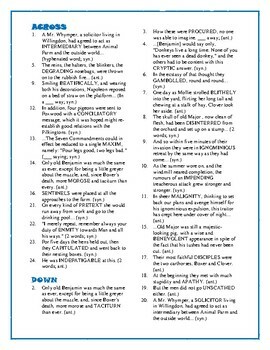 •	ANIMAL FARM: Completing Narrative Quotations Crossword—Fun! Students use their knowledge of the story, their knowledge of language, and their imaginations to complete quotations from the book! —100s of unique products over the books you teach!